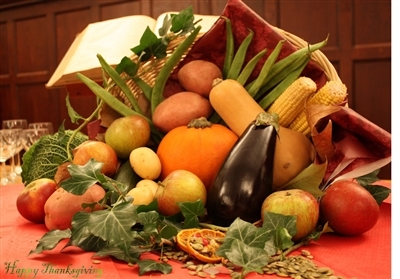 What is necessary, O Gift-giving God, for us to have a fulfilling Thanksgiving? Our heads are already busy making plans for this festive day. Many have been to the store, groceries are bought,recipes are laid out, and soon the turkey will thaw. What are the necessary ingredients for this day, O God? FOR SOME it will be when all the family arrives home again, and all are gathered together. FOR SOME it will be when they finally leave the hustle and bustle of the airport’s busiest travel day. FOR SOME it will be when that phone call comes from the loved one who is not present, who cannot make it across state, or across country, or across the walls that alienate or define a broken relationship. FOR SOME it will come when the dinner is over, the dishes are done and the mess is over for another year. What will make it Thanksgiving for each of us this year, O God? REMIND US again that it isn’t about food, but about remembering and giving thanks. REMIND US that it isn’t about stressing out, but about experiencing family and relationships. REMIND US that it doesn’t matter what we eat, but that any and all across this world have something to eat. REMIND US that it isn’t about everyone being together, as much as it is about everyone being with someone, about no one being alone. REMIND US that it isn’t as much about giving thanks with our lips as it is about living thankfully with our lives. REMIND US again, O God, that it is not about what we have been able to acquire materially, but about what we are aware of spiritually — that it is never about what we have gotten ourselves, but about what we have given to others. So may each one who gathers around a table filled with food remember one who is hungry. MAY EACH ONE, surrounded by family, remember one who is lonely or alienated. MAY EACH ONE who has so very much, be motivated to give to one who has little. MAY EACH ONE who is warm and comfortable in their home remember one who is without a home, or necessary heat, or a place to lay their head. MAY EACH ONE who laughs with joy remember one whose life right now is without joy. MAY EACH ONE whose heart overflows with love for another remember one whose heart is broken over a loved one gone. MAY EACH ONE who knows family harmony and peace be reminded of one whose family relationships are complex and mired with too much history and too little reconciliation. O God, are not these the necessary ingredients for each of us who gather to give thanks this week? Do you not call us to always treasure the blessings and do you not beckon us to always share of what we have? Do you not call us to the table, with one hand reaching forth in humble thanks for all we receive, and the other hand reaching out with all we have to give? “Come ye thankful, people come” we sing. We bring ourselves, in grateful response to all the gifts you offer to us. We gather around your table, O God, where all are invited, where each is fed, and where none, by your grace, is ever alone. Continue to feed us, O God, in your living and loving ways. * Rev. Marsha Woolley is a United Methodist pastor from the Midwest. This prayer was originally posted at www.readthespirit.com.